Coping with change is not easy. Coping with change that involves every aspect of your life, from health to finances to family and friends is almost life threatening. I started this year on an up note… I was going to attack my health problems head on, starting with an exercise program I could live with. As usual that fell through about a month into the process. Partly it was my own damn fault because I could have/should have chosen to go ahead and keep swimming on my own when Joe became unable to go swimming because of his problem with his foot. But I didn’t because it had been one of the few things we did together out side of sitting at home watching TV or going to the doctor. So the first resolution to take care of myself went out the window so early in the year it was hardly a memory when along about the 1st of March, I thought I was having a heart attack. Yep. That is what I thought. Chest pain — like an elephant foot pressing into my chest… shooting pains down my left arm. Jaw pain and neck pain that didn’t want to quit. I put up with it silently and then one day some talking head on TV in a red dress said “You might be having a heart attack if…” so I made an appointment to see a doctor. Now this in and of itself was a horrible decision to make. You see, I have no health insurance. I have not had health insurance since my husband became disabled in 2009. We had to give it up at the beginning of 2010 when I was no longer covered by the University’s health insurance policy that we had to pay for to keep Joe alive. Had I wanted it, the price would have doubled and at the time I thought 57 and more or less healthy — I’ll be fine. Don’t believe you will be fine without health insurance — especially if you are in your late 50s. Your chances are not good. Even if you are relatively healthy, anything can happen. I blithely went to the doctor, thinking that I was probably going to get an EKG and a scolding for being too fat. No. When I walked in and told them my symptoms the Nurse Practitioner, who had started her nursing career in our local hospital’s Emergency Room, turned me right around and said “Go, NOW to the ER. Do not go home and get your husband, do not go anywhere else, go straight there and tell them what you told me.” So I did. I spent the next two days in the hospital having tests on what is called a “step down unit”. This unit is a one-off from the Intensive Care… your telemetry can be transferred immediately to the Intensive Care unit (conveniently located on the same hall, within steps of your room) if need be. Ultimately they decided that I had some coronary blockage but not bad enough for bypass just yet, and, worse, anxiety. Severe anxiety. No kidding… And just to make me more anxious, they sent the social worker by to talk to me about the bill… one that has after a second hospitalization for more chest pains in June, has now risen to the $35000 range. Hell, if you had my life you’d be anxious too. But then everyone with anxiety feels that way, or we wouldn’t be anxious, right? And we’re only up to June. Why am I anxious? Well, I am unemployed since September 14, 2009. I have applied for 97 jobs since then and I have 97 form letter rejections to go with each of those earnestly written cover letters for each of those 97 positions. With each rejection comes just another tightening of the throat, a little more pressure on the chest and pushes me just a little closer to the acceptance of the inevitable. The inevitable truth of my condition of unemployment is that it is permanent. I will never work for another person again as long as I live. Someone who is old, over-educated and unemployed for over 2 years is UNDESIRABLE. Recently I read about a petition being circulated to urge Monster.com (and other job websites) to ban advertisements that tell applicants not to apply if they are currently unemployed. It would seem that some employers have an interesting “policy” that if one has been unemployed for 6 months that one may not apply for the jobs being offered to the general public. Some how this seems discriminatory — but of course isn’t because “unemployed” is not a protected class. So what does one do when one finds that she must give up the idea of being an employee and become what? Self-employed? (because I love to work at nothin’ all day?) With all due respect to Bachman Turner Overdrive, I liked going to work…even when I was annoyed. I find it annoying that there is no work for me, a well educated, hard working, literate human being who actually wants to be in an office or somewhere, productively creating for the good of humankind and receiving remuneration for same. But, I’m told, I must learn to cope with this change. The inevitables that aren’t going away. The lemons that must be made into lemonade. I used to work for a corporation that arrogantly published the “core values” and then made us all wear them on our name tags so that we could remember what the corporation was trying to accomplish. I expect to perform meaningful work for the betterment of humans. I expect a living wage for the performance of that work. I expect high quality medical care that keeps me alive and healthy and will not send me to bankruptcy court. I expect decent housing that is affordable, manageable and maintainable. I expect city/county/state/federal services that provide sanitation, good roads, clean water and air, and ensures my safety in times of danger. I expect to pay for these services with reasonable taxes. I expect honesty from all levels of government. I want to go on, write a manifesto, a constitution, a declaration… but the very interesting thing is that those things have been written. We don’t need new ones we need to respect the old ones. Oooops. Did I use that word “old” as in “too old” or “outdated” or “unemployed for more than 6 months” … Our world is a dangerous place. Is it any wonder I am…. This quote is from his April 1953 “Chance for Peace” speech regarding (among other things) the death of Lenin. Last but not least, he warned us about the Military-Industrial Complex. He had good reason to because…. 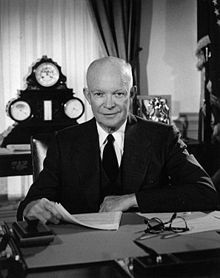 Not everyone is perfect – just as Obama is not the Perfect Democrat, Eisenhower was not the Perfect Republican… BUT there was a balance to the guy. It is hard to see “balance” in any of the current contenders for the job. I’d just like to find a Republican like Ike… one that isn’t “all” bad.